This family is closely related to the Peaflowers, so much so that the two are commonly linked together. The fruit and seed are alike, but the flowers differ. In Tasmania we have many species, but they all belong to one genus, Acacia, locally called Wattle, or, in some instances, Mimosa. This latter name should not be used, as we have no true Mimosas. In Tasmania we have seventeen species, and for the sake of convenience we can divide them into three groups accord-to the shape of their leaves. One group has divided leaves, a second has flat, blunt leaves, while in the third they are simple and prickly. 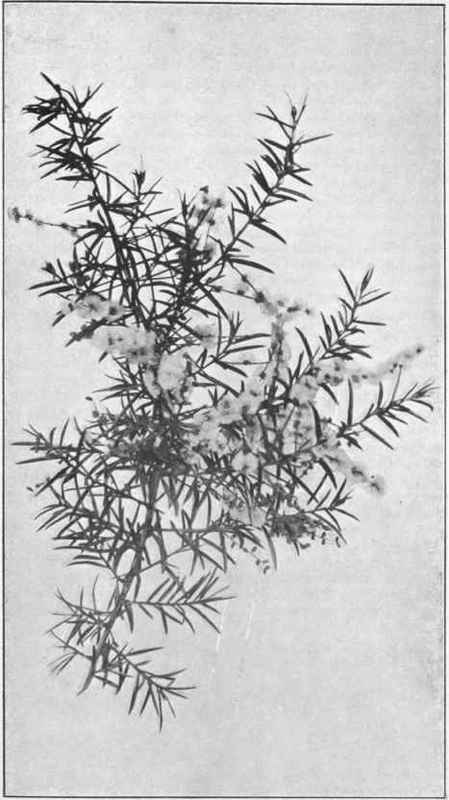 Of the first we have three forms: Silver Wattle, whose ultimate leaflets are very narrow and clothed with delicate hairs, giving a bluish tinge to the foliage - it flowers in the spring; Black Wattle, in which the leaflets are the same shape, but nearly hairless and dark-green - it flowers at midsummer; and River or Green Wattle, whose leaflets are broad, and whose flowers mature in the autumn. Of the broad, flat-leaved forms, Blackwood, Native Willow, and False Boobyalla are the commonest. There are several prickly-leaved forms, and they are mostly known by the one name, Prickly Mimosa. All these forms, when young, have divided leaves, and in response to injury at least Blackwood may throw out such at any period of its life. The simple forms are produced by broadening of the leaf-stalk and suppression of the leaflets. This is an adaptation to make them better suited for our very sunny climate. This reduction of leaf surface and thickening of substance, which may, however, be brought about in a variety of ways, is very common in sunny countries, especially where rainfall is not correspondingly heavy. It is very noticeable in Australia in all sorts of families. The flowers of Aoacia, from their small size and the habit in most species of being massed together in heads, renders them somewhat difficult to examine, and impossible without a lens. Each of the fluffy spheres we see consists of many flowers. We can detect this better before they have opened. The calyx is minute, and consists of four or five free or slightly united sepals. The corolla is scarcely larger; the petals are the same number, all equal and seldom united. The stamens are very numerous. Their filaments are very long, slender, and free, tipped with minute anthers. The solitary carpel, shaped just as it is in Peaflowers, is very small, yet contains several ovules. It is prolonged into a very slender style, which is much longer than the stamens, and appears as a delicate bristle protruding amongst them; it is tipped by a minute stigma. The fruit is a legume, that is, a pea-pod, which varies in shape according to the species. Acacias generally bear abundant flowers, but few of them produce fruit. The copius formation of pollen and its close contiguity to the stigma must ensure some of it being received in every flower. This would lead to the supposition that crossing is imperative. A considerable amount of honey is formed, and bees much frequent them; probably, also, small birds assist. The seeds are of the shape of small flat beans. Their coat is dense and almost impervious to water. This enables them to retain their vitality for a long period. But no credence must be given to the statements often made that seeds may retain their vitality for many centuries. This matter has been well thrashed out, and it is fairly certain that very few, if any, can retain the power of germination up to one hundred years. This will be further considered in another chapter. Of our seventeen Acacias, most are commonly to be met in the bush. The three with divided leaves have a very similar floral arrangement, namely, in little spheres each made up of many flowers, and the spheres are numerous on much-branched stalks which arise from the axils of the leaves. In the broad-leaved forms we have four modifications. In the pretty little Myrtle-leaved Acacia, which is usually only 1 or 2 feet high, the flowers are rather larger than is the case with our other forms, and are placed singly or few together on the branched flower-stalks. This plant is therefore useful to the beginner who wishes to examine these flowers. In Native Willow and a closely allied form the flowers are in spheres, but each of these is on a stalk of its own, though two or three may occupy the same axil. In Sweet-scented Acacia and Blackwood the flowers are in spheres on much-divided stalks, very much as in the divided leaved plants. The first is a shrub with many long, erect, angled branches with long narrow leaves marked by a central rib; while Blackwood is a tree with broad leaves that have not a central predominating rib. False Boobyalla is a tree or shrub of the coast, with leaves very like Blackwood, but very different arrangement of the flowers. These are numerous and formed in long club-like masses. The name of this plant is bad, as it is not only no relation to, but is not at all like, the true Boobyalla, which is a Myoporum. The only similarity is that they both thrive on the coast. Of the spiney-leaved forms, unfortunately called Mimosas, Spreading Mimosa has flowers arranged as in Native Willow; Prickly Mimosa as in False Boobyalla; Drooping Mimosa has long slender drooping branches with the flowers, though many, not massed, but arranged singly along the flower-stalks. People who have lived all their life in Australia, and have from their childhood grown up amongst shrubs and trees with restricted foliage, consider such a condition a matter of course. But anyone arriving from such a humid climate as England is greatly struck with the absence of dense leafage, and consequently effective shade, also the sombre tints of the forests. If you are caught in a shower in the Old Country you stand under a tree till the rain has passed; but it would be a very insignificant fall that a Gumtree or Wattle would protect you from; also, in intensely hot weather, it would be nearly as easy to get sunstroke under a Eucalypt as it would in the open. In quiet damp valleys and gullies foliage may abound, but the general character of our Australian plants is that of reduced leaves of thick texture, and this has an evident meaning. The green surface of a plant is a matter of the utmost importance. It is this surface that enables it to perform the marvellous work characteristic of plant life, namely, of constructing food from the simple substances present in the atmosphere. It is to this green layer that practically the whole of the plants and animals upon the earth's surface are dependent for their living. It may therefore be recognised that the larger the green surface a plant can expose to light the greater quantity of food will it be able to construct. The development of leaves is the common way in which a plant enlarges the surface; but there are other factors to be considered. Plain surface means rapid evaporation, and this loss of water has to be made up by correspondingly rapid absorption by the roots. If the evaporation from the leaves is in excess of what the roots are able to absorb and pass up through the stem, wilting and cessation of function will take place. Not only that, but it is found that too rapid a passage of water is itself injurious. Also the green tissue of a leaf is a very delicate organ that will not bear too free an exposure to intense sunlight. Therefore a plant with a copious delicate foliage is ill-suited for growth in a very sunny, dry district. Conversely, we should expect to find in such a district that the plants consist of forms with reduced means of evaporation and leaves modified to protect their delicate tissue. Australia as a whole is far too sunny and of too dry an atmosphere to support such a vegetation as would thrive in Europe. We therefore have a preponderance of plants well suited to our conditions. Leafless plants are common. Plants whose leaves are much reduced in surface and of thick consistency are much more common, while our Euca-lvpts compromise by hanging their leaves up and down to escape the full force of the sun's rays. The Acacias, whose remote ancestors without doubt had extensive leaf surface, have adapted themselves to Australian conditions. Some have no leaves: in others these organs are much reduced; and in all structural changes have taken place to reduce evaporation and the penetration of too intense light. The three great families typical of the Australian bush the Myrtles, Proteas, and Legumes, are conspicuous in the structure of their leave?. If these organs are not reduced greatly in surface their thick, leathery consistency has the same effect. This gives to our landscape the peculiar sombre appearance so much in contrast to our sunny skies.